Jonny Wrate, in his article, “Baku’s Man in America,” on the OCCRP.org website (Organized Crime and Corruption Reporting Project), provided extensive details of Adil Baguirov’s activities and the large payment he had received from Azeri sources to lobby on behalf of Azerbaijan in the United States. Baguirov, who “also helped organize other US-Azeri conferences in Washington, repeatedly testified before the House [of Representatives] in favor of U.S. military aid to Azerbaijan, served as the coordinator of the Congressional Azerbaijan Caucus, and worked prominently in a Houston-based company that claims to have organized a trip by the country’s president, Ilham Aliyev, to the White House,” wrote Wrate. Baguirov and his family have extensive ties with Pres. 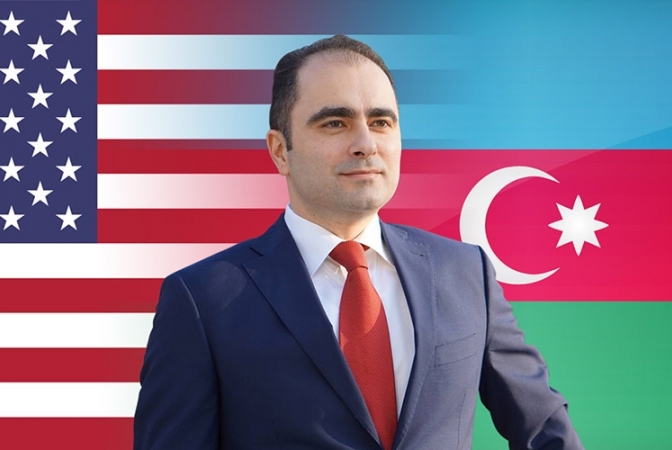 Ilham Aliyev who awarded him a medal for his services in the U.S. on behalf of Azerbaijan. However, Baguirov had not registered as a lobbyist, as required by U.S. law, under the Foreign Agents Registration Act (FARA). When contacted by OCCRP reporters, Baguirov said that the payment he had received was none of their business. Six months before Baguirov received the payment of $253,150, his Houston-based non-profit U.S. Azeris Network (USAN) “helped organize a two-day conference in Baku called “US-Azerbaijan Relations: Vision for Future.” Wrate revealed that two other conferences were organized by USAN in Washington. “The Baku meeting in 2013 was attended by 11 members of [US] Congress, 10 of whom were paid for, and over 30 of their staff — and that, according to a confidential report by the Office of Congressional Ethics (OCE) obtained by the Washington Post, they were lavished with silk scarves, crystal tea sets and Azerbaijani rugs valued at $2,500 to $10,000,” Wrate reported. Furthermore, Wrate revealed that “between 2008 and 2016, Baguirov was also invited almost annually to recommend foreign economic and military aid budgets for Azerbaijan and Armenia to the House Appropriations Subcommittee on State, Foreign Operations and Related Matters. In some years, other representatives of USAN and the Karabakh Foundation—another of Baguirov’s non-profit organizations—also testified.” In his congressional testimonies, Baguirov urged the U.S. Congress to reduce the aid for Armenia to zero, while requesting that Azerbaijan receive $26 million from USAID and $3.9 million in military aid. Baguirov was also the Executive Vice President of International Affairs for Worldwide Strategic Energy, Inc., a Houston-based company that offered its “strong business and political ties” to help prospective clients capitalize on hydrocarbon development opportunities in “politically complicated countries,” including Azerbaijan. The U.S. Justice Department should be asked to investigate Baguirov’s unregistered lobbying activities in the U.S. on behalf of Azerbaijan to see if any illegalities have been committed.